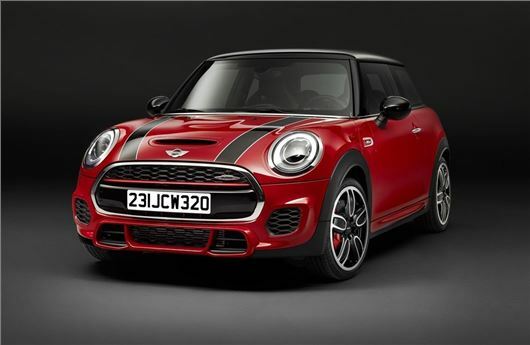 MINI has unveiled the most powerful production model in the company’s history, the 231PS John Cooper Works (JCW) Hatchback. The twin-turbo MINI JCW will be unveiled at the Detroit Motor Show in January before going on sale in the UK in late April 2015, priced at £22,865. That price will be, of course, the starting point for this extremely rapid MINI, with the options list including a six-speed automatic transmission called Steptronic among various stickers and things. A unique head-up display that incorporates rev lights will be one of the more expensive items on the options list. The 231PS and 320Nm engine output, delivered from a twin-turbo 2.0-litre petrol unit, is ten per cent more powerful and, more significantly, has over a fifth more torque, so in-gear acceleration will be notably more alacritous. Indeed, MINI claims a 50-75mph time ten percent quicker than the outgoing JCW’s, at 5.6 seconds. The 0-62mph sprint is 0.2 seconds faster, now 6.3 seconds with the standard six-speed manual transmission equipped, or 6.1 seconds with the Steptronic gearbox. Those figures in mind, fuel economy is surprisingly decent: 42.2mpg and 155g/km, and as per acceleration, Steptronic buyers get an even better deal, with their cars puffing out 133g/km and returning 49.5mpg. In keeping with the JCW’s range-topping status the car gets an array of dynamic, aerodynamic and visual modifications, not least race-derived sports suspension and electronic aids including Dynamic Traction Control, Electronic Differential Lock Control and Performance Control. Adaptive damping is optional, as are 18-inch JCW alloys - 17-inch wheels are standard. A unique front incorporating large air intakes, deeper side sills and a new rear apron mark out the JCW on the road, as does the larger JCW-specific spoiler. LED headlamps are standard, and in the cabin, bucket seats with integrated headrests take the place of the Cooper S sport seats. How do you know the option prices? They haven't been published yet.